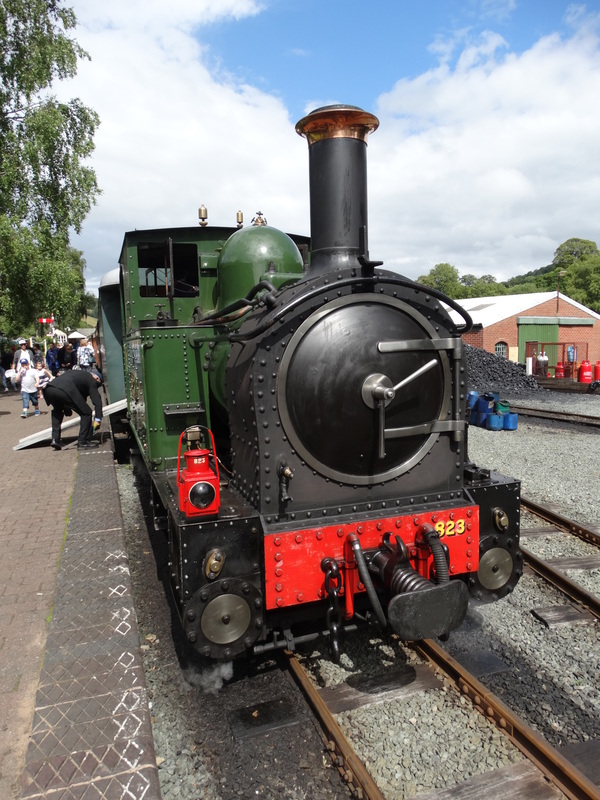 I start my holiday on my birthday (Monday 3 August) and we arranged to meet Roger and Julie (Roger is my Julie’s cousin) at the Welshpool and Llanfair Light Railway. It is a long way from Ponteland. I set the alarm for 0545, but Julie was awake earlier, so we were away by 0537 (I remembered to turn off the alarm). We entered Wales soon after 0900. Through Welshpool, and we were at Llanfair Caereinion and my favourite railway by 1030. What a wonderful place to spend my birthday. 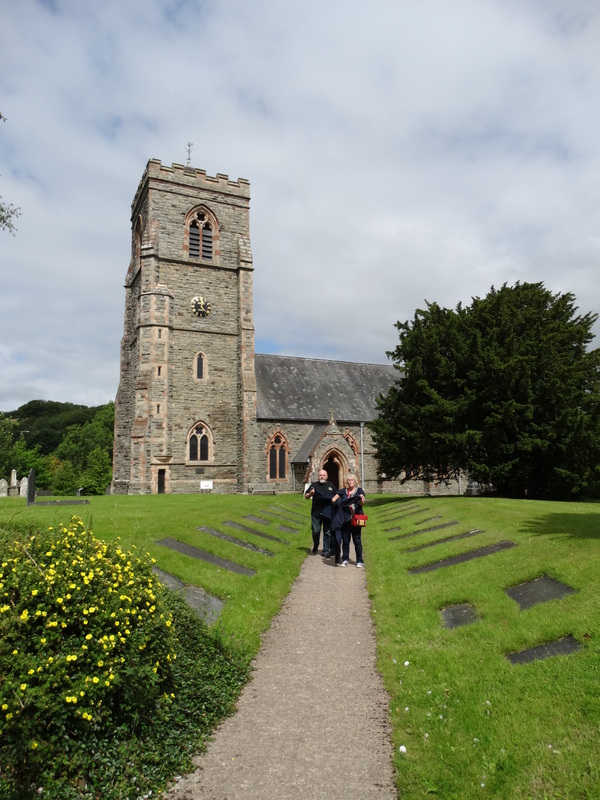 Before we went for a train ride, we walked up into the village to visit the parish church – grid reference SJ104065. 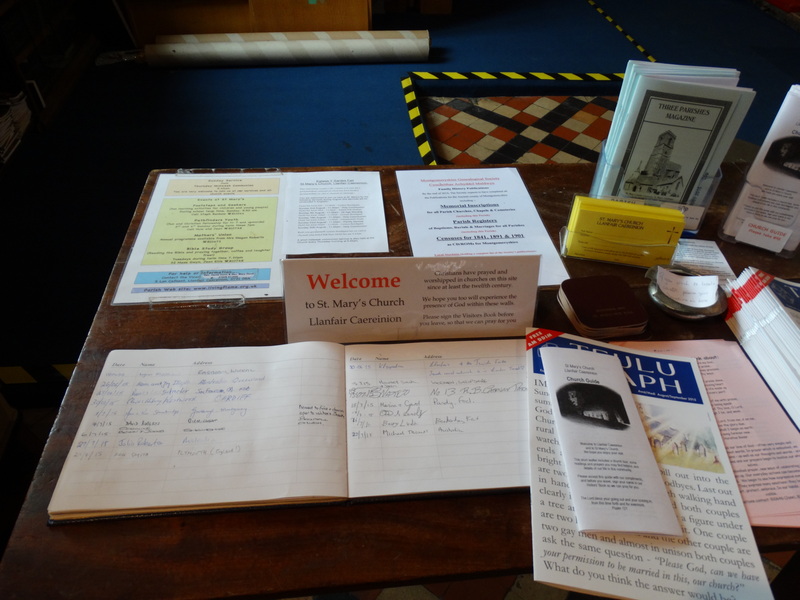 The leaflet and diocesan website says the church’s website is at www.livingflame.org.uk, but that takes me to a plumbing and heating blog. There is a full archaeological report here – it even gives you the 10 digit grid reference … can you stand the excitement? 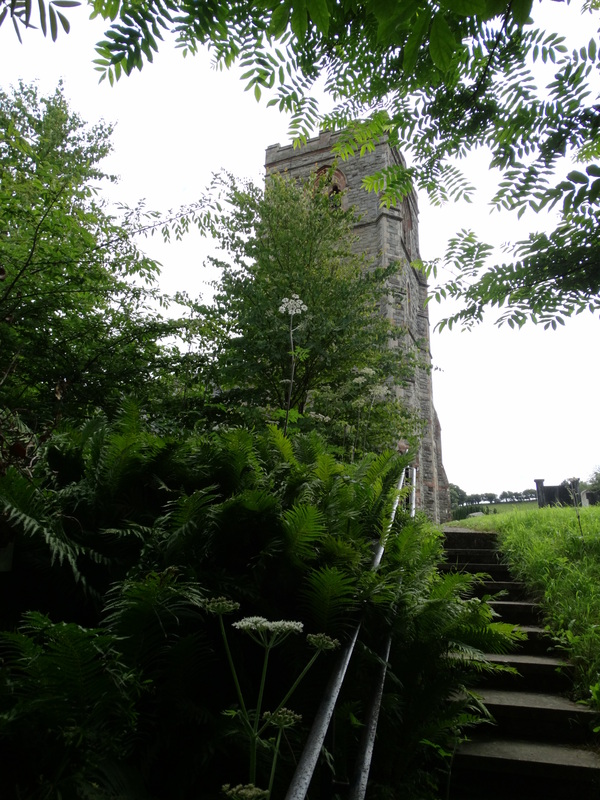 I was glad that Roger was pushing my Julie up the hill, but the access into the church was straightforward (if a little noisy as we opened both doors and pushed our way in!). The suggestion is that Christians have been worshipping here for 1,500 years. 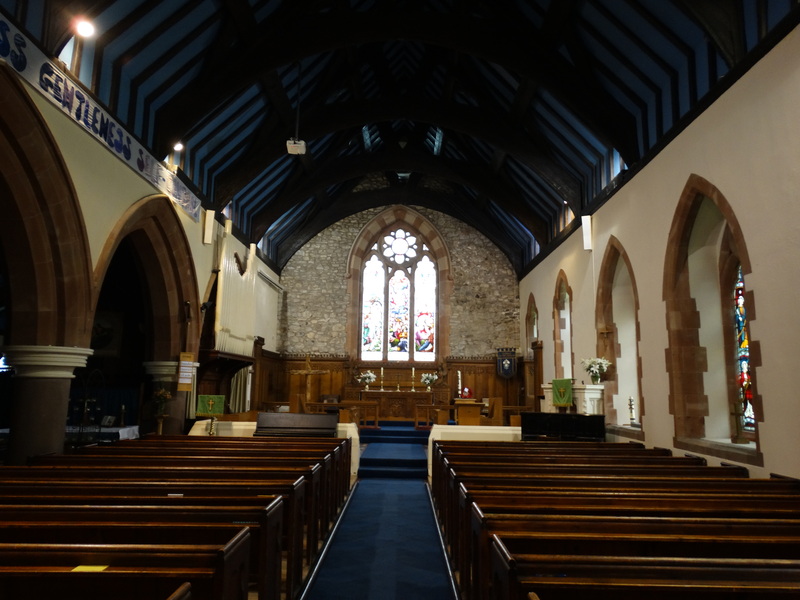 The earliest recorded church is C12, and this Victorian church was consecrated in 1868. 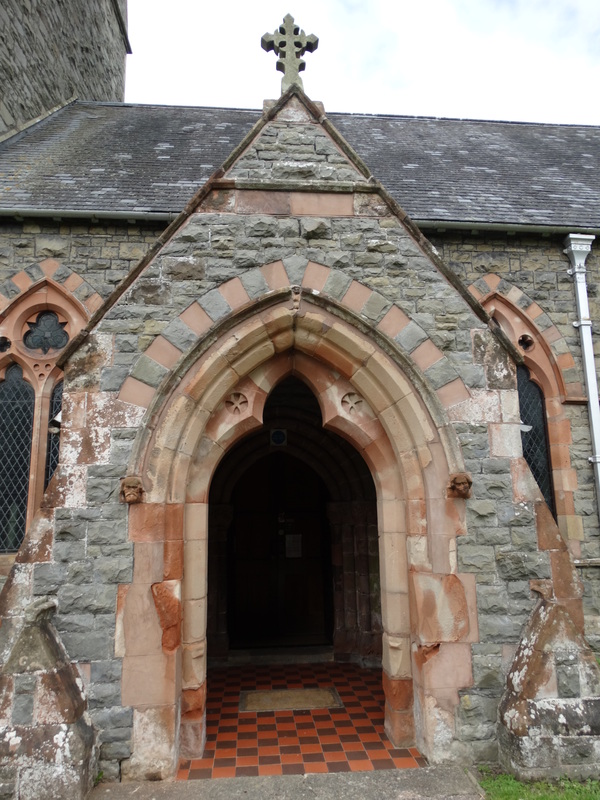 The porch remains from the earlier church. 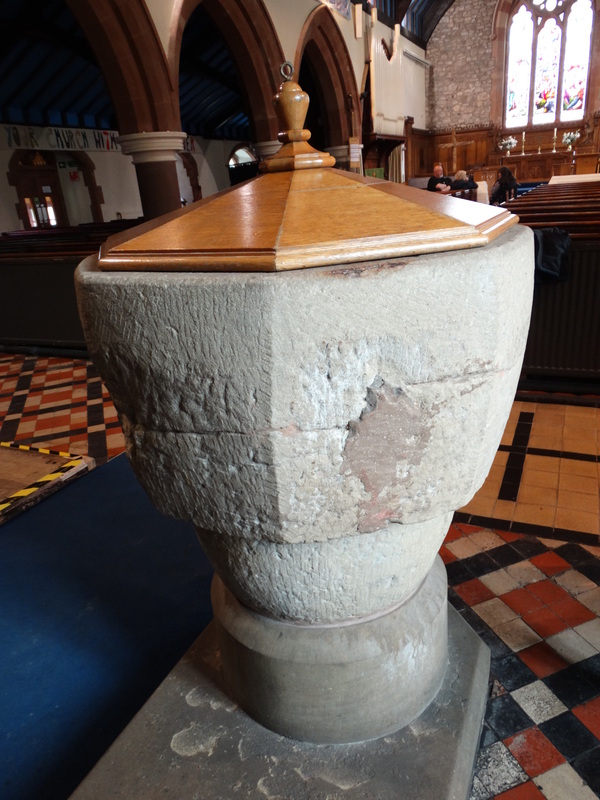 The font dates from about 1200 – apparently the octagonal shape represents the seven days of creation and the eighth day of new beginnings. During the Commonwealth period (1649-1660) it was taken to the Wynnstay, an inn over the road, and used as a feeding trough. A nice welcome table, and the bi-lingual bible reminds us we have crossed the border! 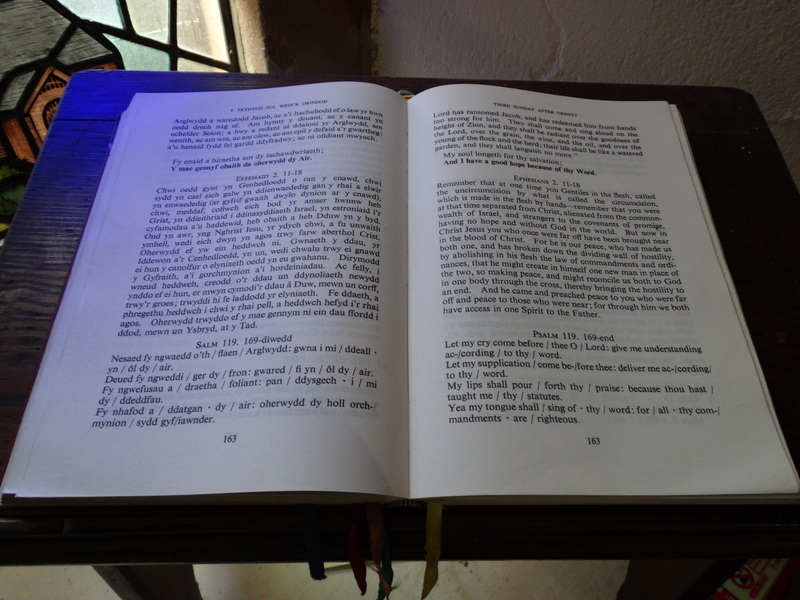 The St Asaph diocesan magazine (June/July) had some good theology about relationships, marriage and gay marriage – you can read the whole magazine at the Diocesan website. Apparently the Aug/Sep 2015 issue has articles on whether our country is a Christian country. 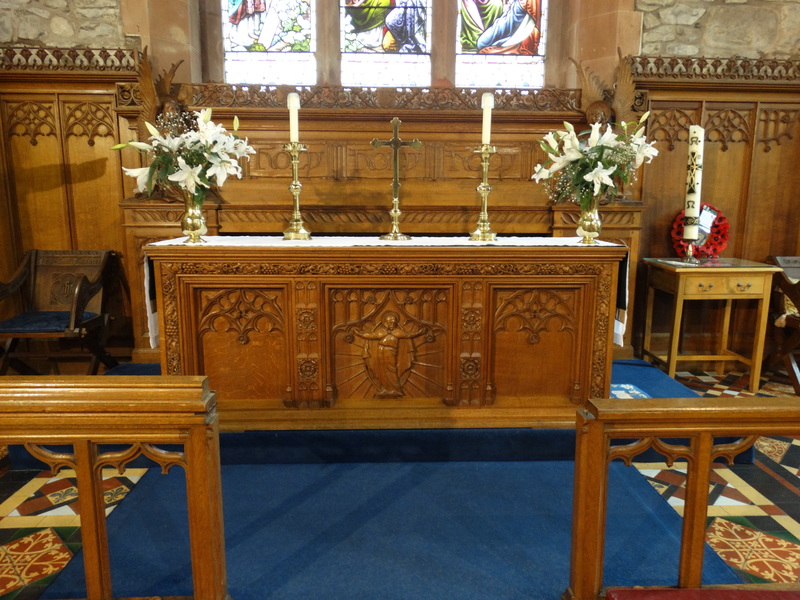 The reredos, altar and altar rail were given in memory of those who died in the two world wars. 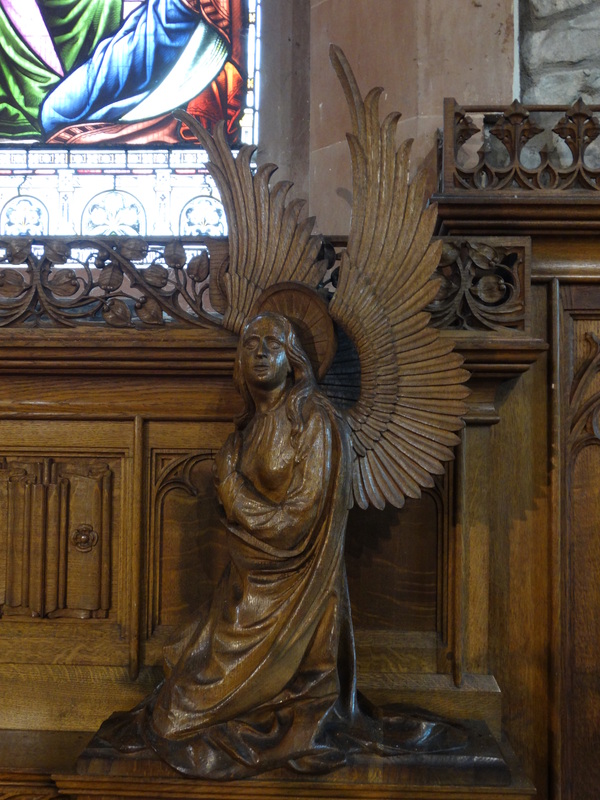 It is a lovely work in oak. 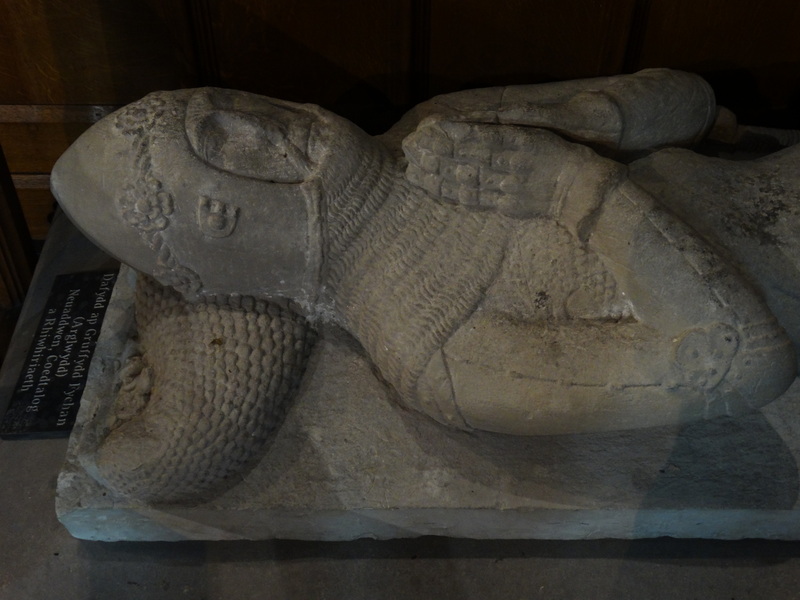 The effigy in the chancel is of Sir Dafydd ap Gruffydd – the leaflet describes him as “a local medieval knight”! 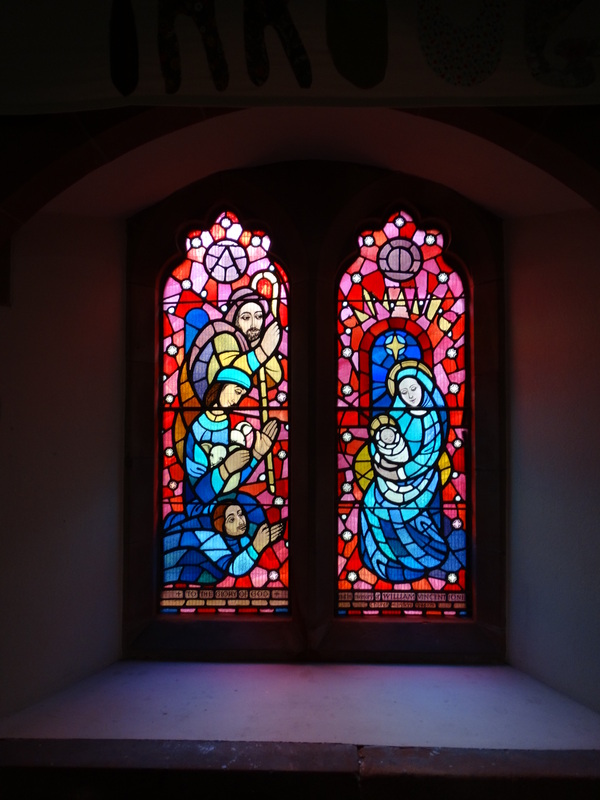 Some nice glass – a lot of Victorian, and some modern work. 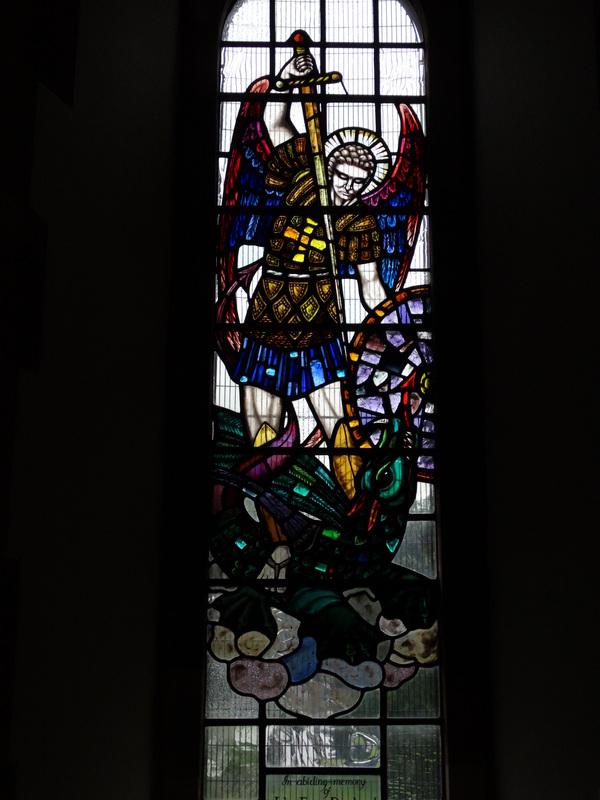 I liked the one of the Archangel Michael. 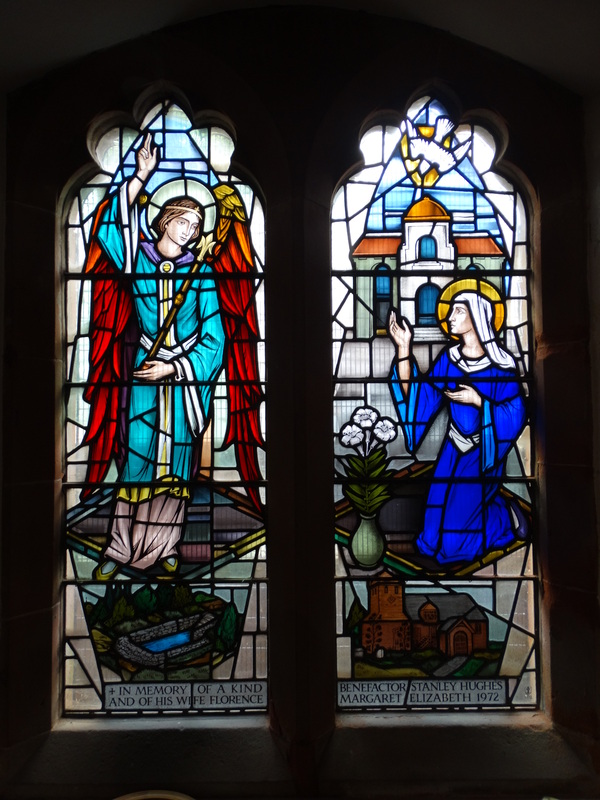 Some 1970s glass – the Annunciation and an Emmanuel window. On the north side of the church is a Holy Well. 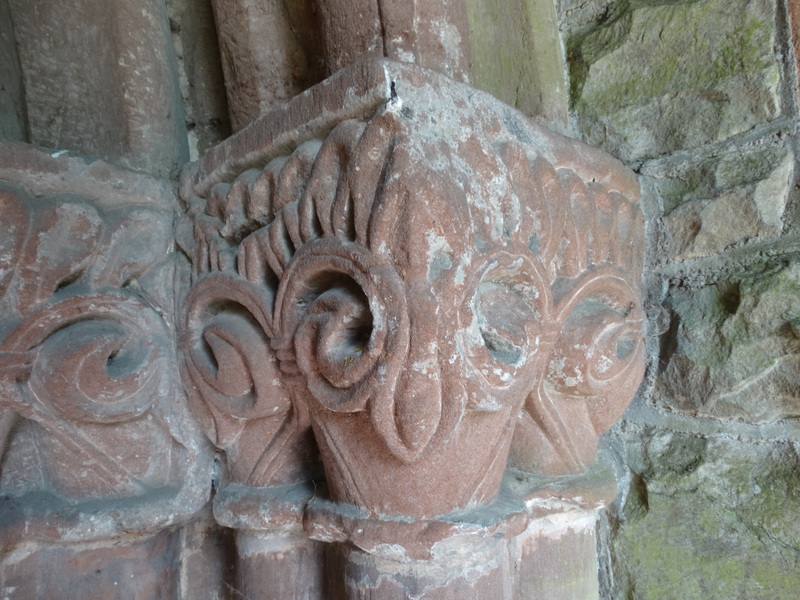 You can never accuse my blog of being narrow and parochial – you find out more about the well at the wonderfully named “Megalithic Portal” website – this is a website that gives the latitude and longitude of each well (that’s where I went wrong!!). They give it a 4 for accessibility – too many steps. 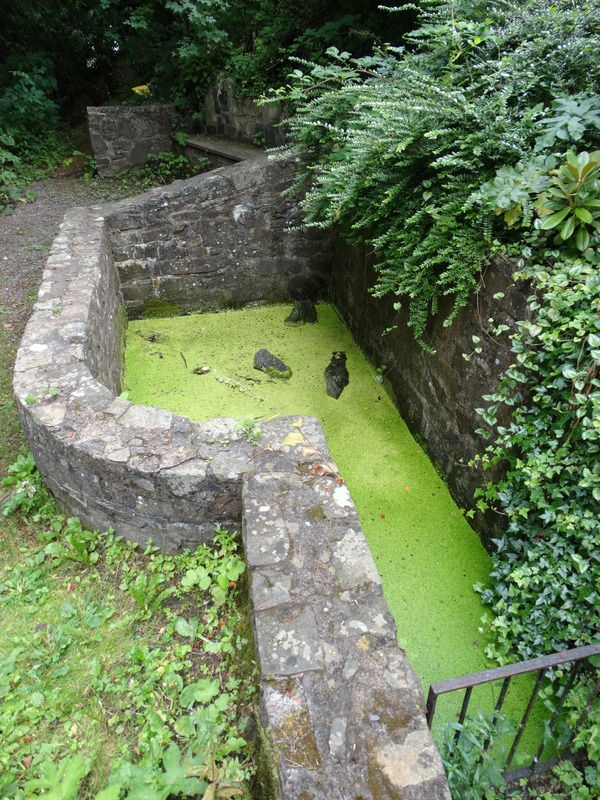 We have been having problems with the greenness of our pond in Hexham – ours is not as bad as this one! 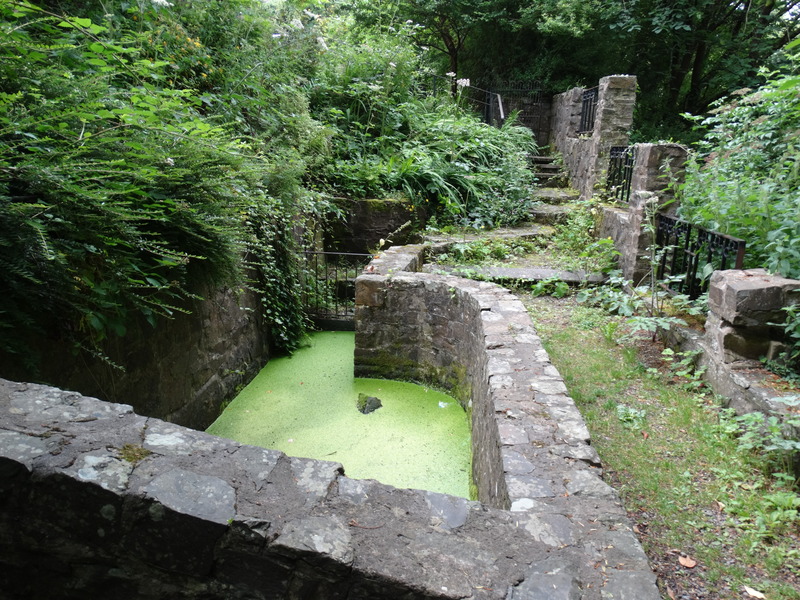 Healings have apparently taken place here into the C20, and the well was restored in 1990. 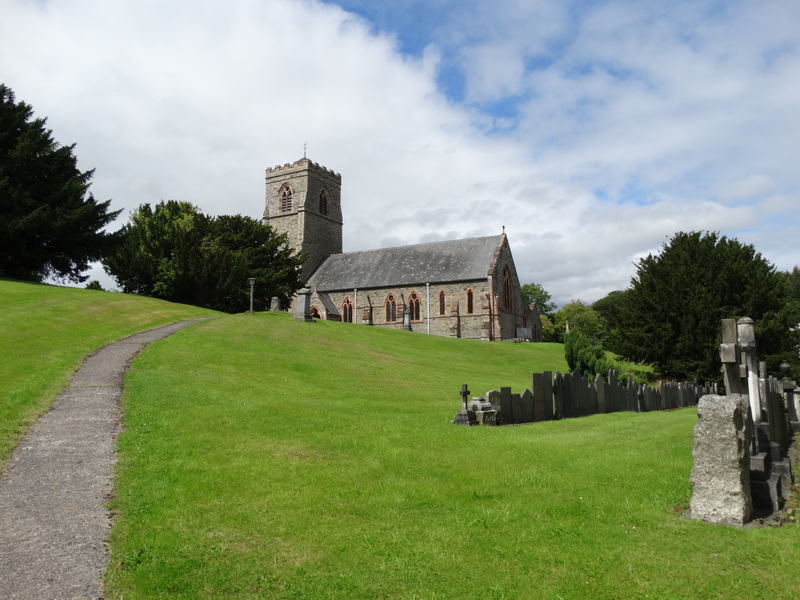 We had enjoyed Llanfair church, but it was time for a train ride. 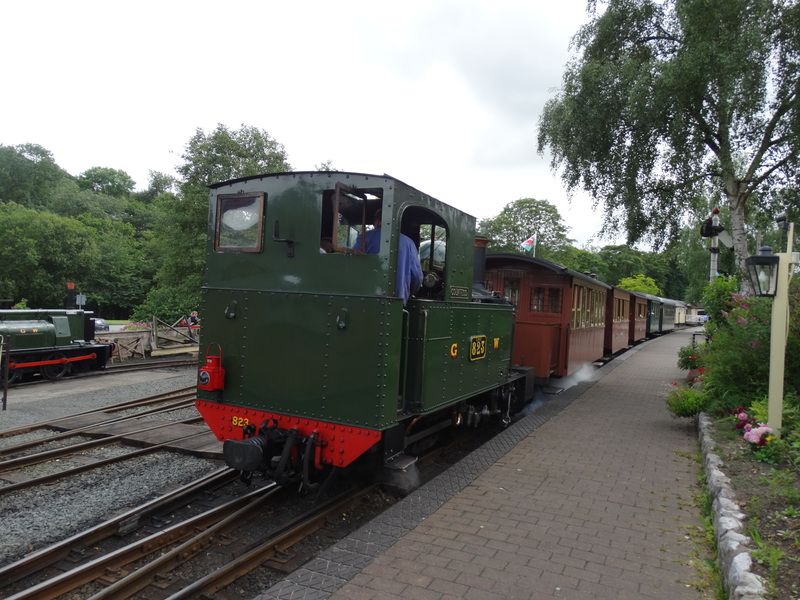 Back to the Welshpool & Llanfair Light Railway – website – which opened in 1903. 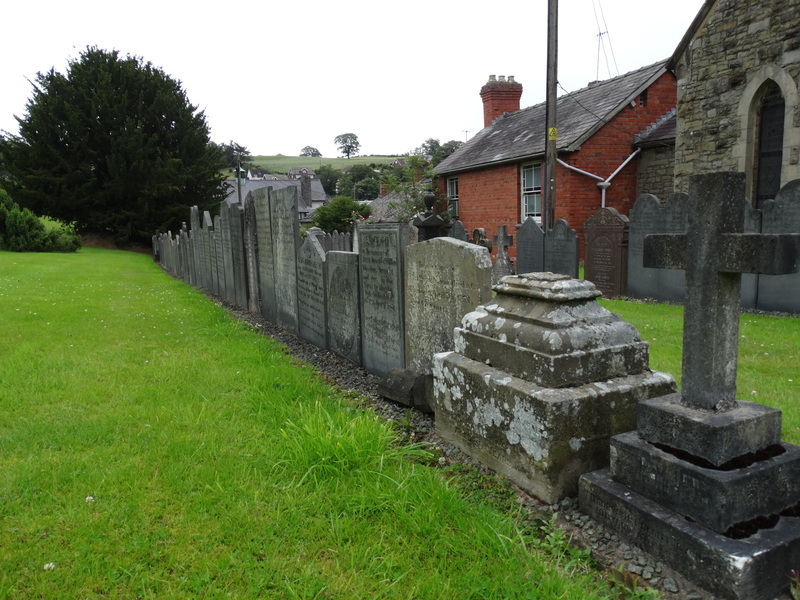 It is a 2 foot 6 inch gauge railway running the nine miles or so to Welshpool – up and down dale, round the fields, and across the Banwy river. The original locos, Earl and Countess, are still in charge, and the staff/volunteers are lovely. I am a member of this line, so I get a free ride and money off in the gift shop. I like Birthdays! 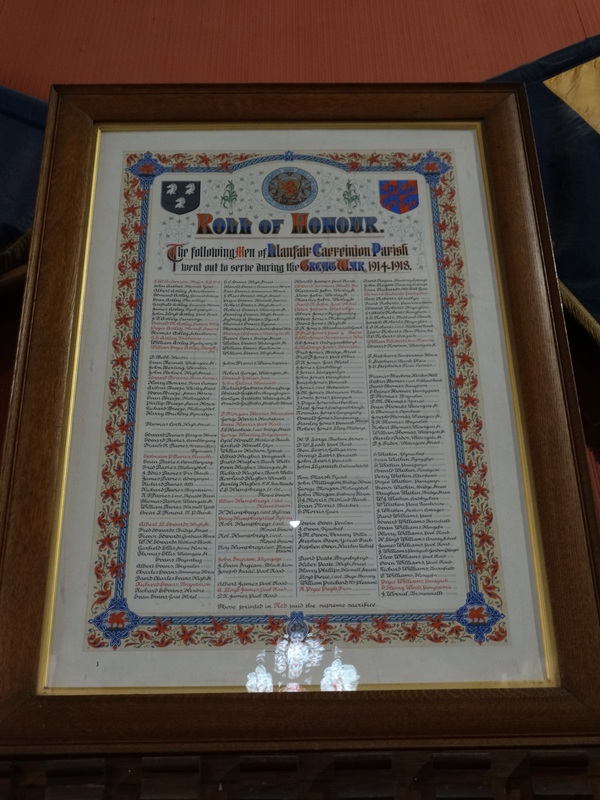 This entry was posted in Outside Northumberland, Railway interest. Bookmark the permalink.